B.K. is available for adoption at UPAWS in Michigan. B.K. was surrendered along with two other cats when the family could no longer care for them. 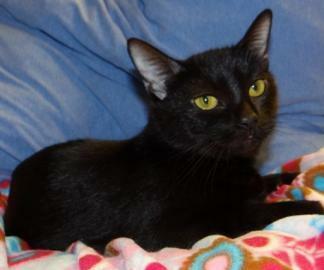 Shy at first, this gentle sweetie warms up quickly and becomes an affectionate and constant companion. At eight years old, she deserves a home in which she can comfortably spend the rest of her life. B.K. is available for adoption through the Upper Peninsula Animal Welfare Shelter in Michigan.